Wild Boar ATV Parts Can-Am Renegade 500/570/800/850/1000 All Models Metal Aftermarket Floorboards Here at wild boar we know the struggle of wanting to run bigger tires, but maybe the fear of making too many changes stops you from wanting to purchase a lift. These new metal floorboards a..
​ Wild Boar Can-Am Defender Front Winch Bumper with Lights It's no secret the Can-Am Defender is one of the toughest machines out there right now. Can-Am knew what they were doing with this beast of a machine. 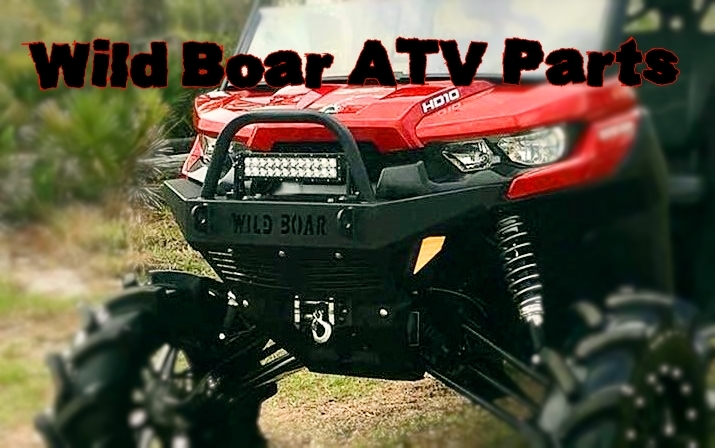 The Defenders are made to do great no matter what kind of riding you put th..
Wild Boar Radiator Relocation Kit with Silver Screen for Polaris Sportsman 700 / 800 2004-Up The Polaris Sportsman 700 & 800 are great machines for any kind of ATV rider. No matter what kind of trails you prefew, you always run the chance of something clogging up your..